speculative thought. 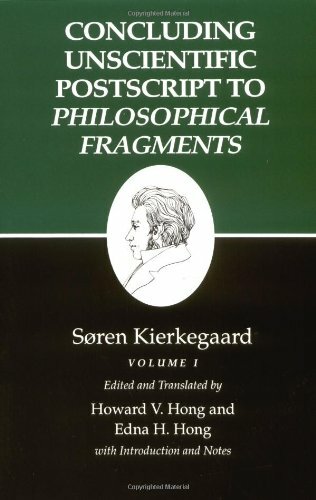 Kierkegaard intended Postscript to be his concluding work as an author. The subsequent "second authorship" after The Corsair Affair made Postscript the turning point in the entire authorship. Part One of the text volume examines the truth of Christianity as an objective issue, Part Two the subjective issue of what is involved for the individual in becoming a Christian, and the volume ends with an addendum in which Kierkegaard acknowledges and explains his relation to the pseudonymous authors and their writings. The second volume contains the scholarly apparatus, including a key to references and selected entries from Kierkegaard's journals and papers. shorter Edifying Discourses, quasi-sermons published under his own name. As he later interpreted it in the posthumously published Point of View for My Work as an Author, the authorship was a systematic attempt to raise the question of what it means to be a Christian. Kierkegaard was persuaded that in his time people took the meaning of the Christian life for granted, allowing all kinds of worldly and pagan ways of thinking and living to pass for Christian. He applied this analysis especially to the speculative philosophy of German idealism. After 1846, Kierkegaard continued to write, publishing most works under his own name. Within Denmark he was isolated and often despised, a man whose writings had little impact in his own day or for a long time afterward. They were translated into German early in the twentieth century and have had an enormous influence since then, on both Christian theology and the existentialist tradition in philosophy.